Domino's Buy 1 Get 1 FREE ~ Philippine Freebies, Promos, Contests and MORE! 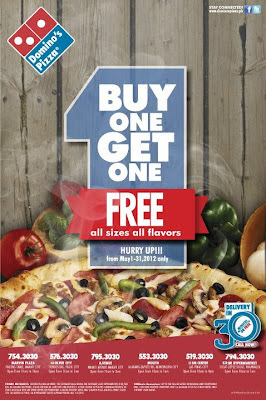 This last month of summer, from May 1-31, 2012, Domino's Pizza is generously having a buy 1 get 1 FREE on all sizes, all flavors of their pizza. Visit any Domino's participating delivery areas (Marvin Plaza, Molito, A.Venue, Silver City, SM Center Las Pinas, SM Hypermarket Sucat) and place your order. Don't forget to tell the customer representative that you will be availing of the promo. There will be a fixed charge of P50 for a P300 minimum purchase. Valid for dine-in, take-out and delivery. Pizza is FREE if they don't deliver it within 30 minutes under the following conditions: Good weather, a maximum of 10 Pizza bulk orders and within 1.5KM radius or up to the village gates or building lobby receptionist only. What are you waiting for? Enjoy Domino's Pizza while it's hot!